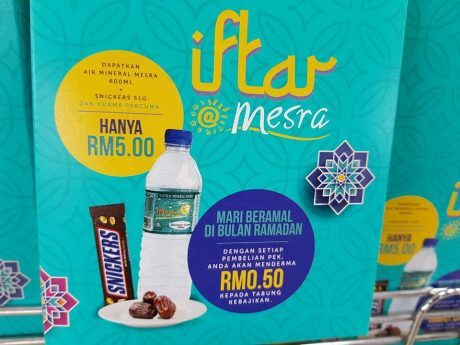 Kedai Mesra Petronas, the petromart of Petronas, has introduced iftar pack. Iftar is the evening meal with which Muslims end their daily Ramadan fast at sunset. The RM 5.00 Iftar pack contains a Kedai Mesra Petronas bottled water 600ml and sweet foods in the form of a Snickers bar (51g) and kurma (dates). With every purchase of each pack, RM 0.50 will be donated to charity organisations. This is an interesting example of how brands are tapping into the pick-me-up convenience at petromart to create a corporate social responsibility (CSR) activity to do good during Ramadan. Based on observation, the iftar pack does not seem to be popular. Perhaps the mix and match method can improve things as not all consumers prefer Snickers.